"Approval workflow, project management and resource management software for marketing teams and ad agencies." 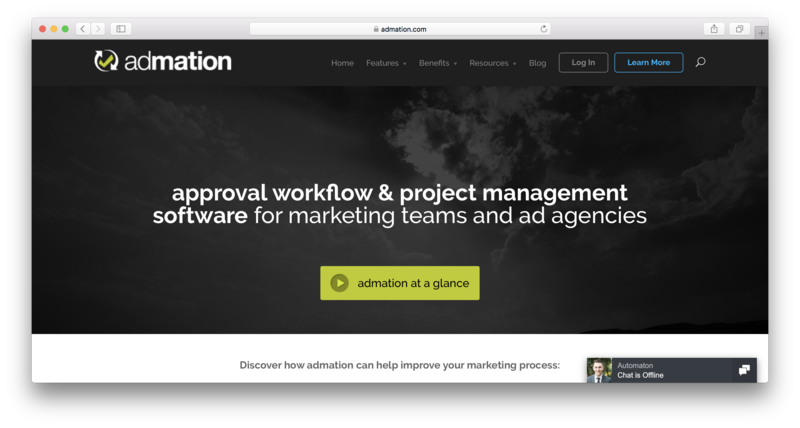 Admation is a project management and approval workflow tool created by people who truly understand the madness of delivering large-scale online ad and marketing campaigns. They’ve created a rock-solid product designed to provide clarity and simplicity to what can often be a crazy process. Admation truly supports delivery – from brief to final delivery of high volume, complex marketing campaigns and creative projects with lots of collateral. Admation is a tool designed for both ad agencies, marketing teams, or any team that is managing the delivery of creative or marketing projects. Admation scored 63/100 in the Project Management category. This is based on user satisfaction (90/100), press buzz (26/100), recent user trends (falling), and other relevant information on Admation gathered from around the web. Admation is a project management software solution equipped with necessary tools for effective management of tasks and projects. With the help of the software services in terms of resource management, project management and planning, approval timeline and workflow and virtual asset management, Admation holistically manages the processes involved in a project from its conception to its implementation. Admation is useful for creative agencies and marketing firms wanting to have their strategies streamlined on a single platform. Admation allows teams to effectively implement their projects with the use of advanced software tools. Its first feature is the built-in marketing calendar. The calendar allows users to organize the timeline of their projects and their respective deadlines in a single unified way. Mobile prompts and notifications alert users to do their respective tasks. Setting up projects is easily done with this software. By simply organizing all the necessary tools for project setup, the software already allows for the efficient implementation of the project itself. Project roles and teams are modified within the system. This gives several members of a team exclusive access to one project. Internal and external stakeholders are given access as well. Roles are also amenable for further modification to determine the level of oversight provided by the system to its users. In addition, all project files and documents are stored in a centralized storage system. The location is accessible to all members of a project team. For employees and managers having a hard time starting a project from scratch, predefined resource templates are available for perusal of the users. This gives new employees a narrower margin for errors common for new managers. Project timelines and Gantt charts are also available in the system. This is useful to provide stakeholders information about the progress of the project. With the software, tasks and deadlines are clearly delineated. These timelines are also given automated approval with the use of the approval network schemes of the software. Before sending out files and proposals to clients, the software always waits for the approval of the project from the executive managers. Department works are also organized with the use of the software. The department dashboard shows the progress of the project within the department. When adding a new user, the timeline is updated. This gives department managers the knowledge of whether the department is taking on too many tasks. Admation also provides automated brief generation for stakeholders and quality checkers. The brief includes important details about the project, such as the overall cost, scheduling and task deliverables. Project managers also benefit from the software by having the tasks in a particular project outsourced to specific departments within the company. This inter-department collaboration is made easier with higher interconnectivity among users. This also ensures reassignment of tasks is done in an easier manner. Tasks that are not performed by the assigned personnel are reassigned to the available personnel at a particular moment. Availability of the employees and team members are displayed in the platform as well. Timesheets are also one of the key features of the software. Time and motion studies are easily conducted with the use of the software’s built-in task timer. The time it takes for a task to be completed is automatically stored on the timesheets of the company. The resources of the company are also managed effectively by Admation. By analyzing the analytics of the previous task cycle, managers are given data on the possible bottlenecks within the resource demands. By predicting them, they’re easily prevented. The software enables easier administration of the tasks on hand. By filtering and sorting out data on grounds of deadline, client demand or urgency, Admation gives users a bird’s eye view on the status of even the smallest aspect of the project. Approval dashboards within the software enable users to have a consolidated toolbar for all the things related to the approval of a project. All briefs, files, estimates and documents are stored within the dashboard. The approval workflow is also amenable for modification upon the demands and requests of the client. Shorter workflow is needed for smaller projects. Otherwise, inefficiency ensues. Similarly, the online proofing tool-set of the software allows users to generate a proofing scheme with the help of tools for review, markups and comments. The proofing tool-set includes basic freehand drawing, polygons, arrows and marker color control. Changes within a file are done in PDF or JPEG format. This saves the administrators time by removing the process of file conversion within the workflow. Managers are given better control in terms of managing projects and tasks. Dashboards allow managers to create modifications to the works whenever necessary. The data of the users are stored in secured memory storage. Easier retrieval of these files and documents is done with the use of the download cart features. These retrieved files are integrated to newer projects for easier implementation. Data on the efficiency of projects are determined with the use of the built-in analytics of the software. Admation keeps track of the length of time spent in a single project, the entire cost associated with the project operations and the number of skills allocated in the particular project. Similarly, the software also analyzes projects on an individual level. The software keeps track of the length of time spent by a user when performing his specified task. By studying the time records of an individual, managers are given an insight to the level of performance an employee has. This also allows managers to quickly supplement the project team with additional personnel if the situation calls for it. The pricing plan of the software is dependent on the nature of the business and its marketing and project management needs. Prospective users are advised to contact the developers of the software for the pricing plans offered by the company. Admation combines multiple features of project management and creative workflow administration in one platform. The software simplifies the entire process of advertising and project management—from the management of the members to the implementation of the workflow calendar. Admation is useful for creative agencies needing simplified and holistic software for all the technical demands of virtual marketing. It is also specifically useful for various departments and core personnel within a firm such as the client services, management and the project and compliance managers. Pricing starts at $25 per month per user for up to 10 users. What is Admation generally used for? Admation is a cloud based marketing project management solution which incorporates project management, resource management, approval workflow & DAM into one easy-to-use tool. Admation helps ad agencies and marketing teams to plan and track creative projects with increased transparency and collaboration; and streamline the approval workflow. Key features include briefing templates, project timelines, online project tracking, timesheet recording, task management, online markup (all media), batch feedback, tiered approvals, DAM and many other user-friendly features. What are some applications Admation is commonly used in tandem with? Admation is an online end-to-end solution that can replace the need to have multiple tools to manage marketing projects. Does Admation offer multi-user capability (e.g. teams)? Yes, Admation works best when used with teams, internal and external users or used between a client (brand) and an ad agencies. Who are the main user groups of Admation? Does Admation offer an API? Yes, please speak with our product team with regards to your integration requirements. Does Admation integrate with any other apps? Please speak with our product team with regards to your integration requirements. Does Admation offer guides, tutorials and or customer support? Yes, we offer a range of training options from onsite personal training, to online remote sessions as well as a comprehensive list of training guides and videos.